1Click Add Photos/Video in the Share box on your Home page. This opens the same interface for exploring your hard drive that you used to upload a single photo. 3Select multiple photos by pressing the Ctrl or Command button and clicking the files you want. If you use a program like iPhoto to organize your photos, create an album there first; then navigate to it and select all those photos to add to Facebook. You’ll save yourself some time trying to figure out whether you want to use IMG0234 or IMG0235. 4When you’re done, click Open. The Upload Photos window appears. The progress bar fills with blue as your photos are uploaded. As your photos upload, you’ll see three empty text fields at the top of the page. Click Untitled Album to add an album title, Where Were These Taken to add a location, and Say Something About This Album to add a description of the album. You can click the Add Date link to add the date the photos were taken, which is especially useful if you’re adding photos from the past and you want them to show up way back on your Timeline. 6Decide whether you want your photos shown in standard or High Quality resolution via the check box at the bottom of the screen. High-resolution photos obviously look a bit better, but they also take longer to upload. Unless you’re a pro photographer or using a truly professional-level camera, standard quality is usually sufficient. 7Choose who can see the album using the Privacy menu. The Privacy menu reflects the privacy setting from the last time you posted something. For example, if you last posted something publicly, the Privacy menu displays the globe icon and says Public. As usual, the basic options are Public, Friends Except Acquaintances, Friends, Only Me, or a Custom set of people. 8After your photos finish uploading, add descriptions to individual photos. Click on friends’ faces to tag them. Type the name of the friend in the box that appears. The thumbnail of each photo has a blank space beneath it. Click into that space to add a caption or description of that individual photo. You don’t have to tag friends in your album. However, tagging is highly recommended. It allows your friends to learn about your photos more quickly and share in discussing them with you. 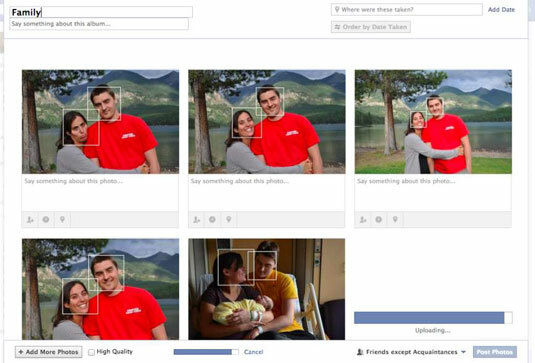 If Facebook’s facial recognition software detects many photos of the same face, you may see a screen that shows you all the photos of that person and asks Who Is in These Photos? 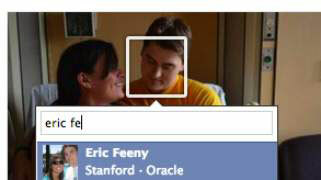 This allows you to make sure your friend is tagged in many photos without having to enter his name a zillion times. You may add tags or skip to go to the album view of your album. After you get to the album view, you may rest assured that your album has been added to your Timeline and may appear in your friends’ News Feeds.